The Robert J. Kleberg Public Library is pleased to offer Wi-Fi Internet access as another service that helps to fulfill its mission of providing equal access to materials and services in a variety of formats that meet the educational, informational and recreational interests of a diverse community. The Robert J. Kleberg Public Library is committed to providing an environment appropriate for its patrons and employees. 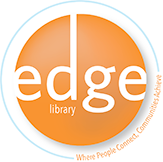 Patrons utilizing the wireless connection agree to comply with all applicable provisions of the library's [ Public Internet Access ] policy. Wireless Internet users are asked to refrain from displaying materials on their personal computers that may be interpreted as intimidating, hostile, offensive or inappropriate. Internet users should not display offensive material to passersby. Transmission, reception, or display of any communication materials in violation of any U.S. or state regulation is prohibited, including but not limited to: Unauthorized duplication of copyrighted material, and Access or dissemination of threatening or obscene material, or of material protected as trade secrets. The Library reserves the right to take appropriate action to insure compliance with this policy. The Robert J. Kleberg Public Library Wireless Network system is unfiltered. Therefore parents, legal guardians or caretakers must take the proper precautions if their minor will be accessing information via the library's Wi-Fi Internet service. 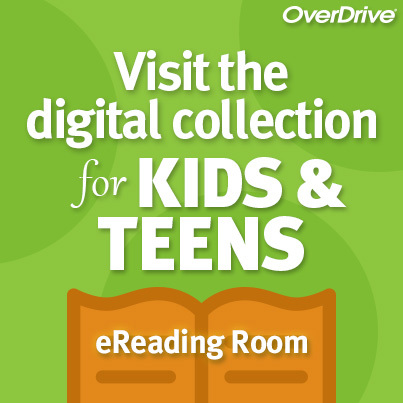 Parents, legal guardians or caretakers must assume responsibility for deciding which library electronic resources are appropriate for their children. Although many potentially valuable sources of information are located throughout the Internet, some resources and destinations contain material that some patrons may find offensive or unsuitable for children or inappropriate for use or viewing in a public setting. The library cannot control the content of sources found on the Internet. Therefore, patrons must evaluate the validity and desirability of the information found. The Library is not responsible for Internet content, for changes in content of the sources to which the library's Webpage links, or for the content of sources accessed through secondary links. Parents, legal guardians or caretakers should monitor and guide their children in use of the Internet and inform them about websites they should not access. The Library is NOT responsible for any misuse of the Internet or Wi-Fi Network by minors. Library staff will not change settings on patron's equipment. Staff will only provide limit general information on the settings necessary to access the Internet via these connections, but cannot provide technical support for patrons using their own devices. The staff cannot guarantee that your hardware will work with the library's Wi-Fi connection. Staff cannot assist in making changes to the User's network settings or perform any troubleshooting on the User's own computer. The Robert J. Kleberg Public Library offers wireless 'Web Printing' to patrons using either an Internet-connected PC or wireless device. All wireless users are subject to the library's Public Internet Access and Wireless Internet Access policies. (a) Signal Range--Wireless Internet access is available within the library's building radius. Signal strength is dependent upon a variety of factors, and you may need to try a couple of locations to get an optimal signal. Once your wireless device is turned on and detects a signal, it will indicate all the wireless networks that are available. We strongly recommend that all users take measures to ensure the security of their Internet connections. Not all Wireless networks are secure. The library offers both secure and unsecure wireless connections. 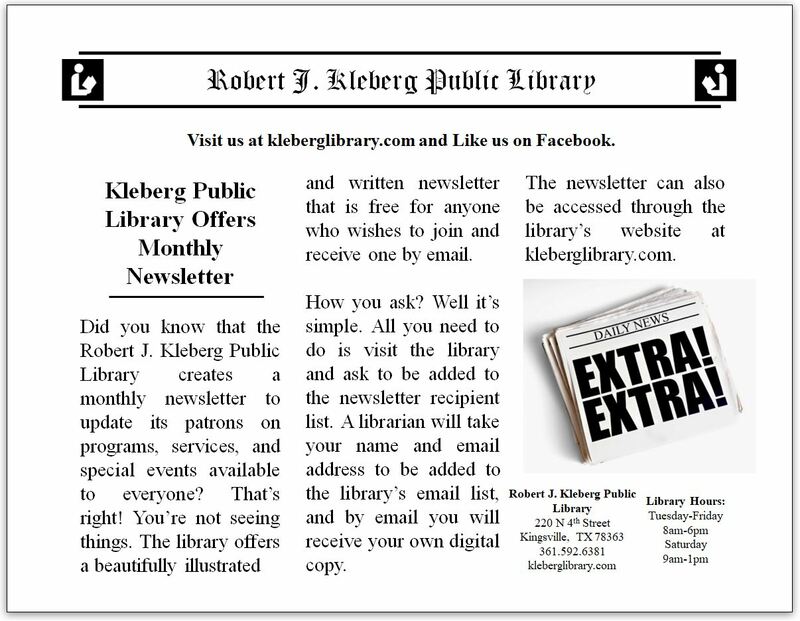 Our regular network ID is: kleberglibrary. Our secure network ID is: kleberglibrary-secure. Patrons can obtain the password at the Circulation Desk during regular business hours. It is the User's responsibility to adopt security measures that are best suited for their purposes. (b) Print Jobs--Please remember the print job Reference Number that is generated. You will need to provide that information to the attending librarian at the Circulation Desk in order to release the print job. (c) Fees--For a nominal fee, patrons can choose to print in black & white or in color on LETTER SIZE paper only. Payment must be made at the Circulation Desk. All print jobs not released or paid for will be deleted at the end of the next business day. (d) Web Printing--Patrons are able to print virtually any document or web page from their Internet-connected PC or wireless device using the library's 'Web Printing' provider. There are no print drivers or other software to install. To access this service, click on [ Wi-Fi Web Printing ] and follow the on-screen instructions. Note: Web printing services are available: Tue-Fri 8:15 am to 5:45 pm and Sat 9:15 am to 12:45 pm. The Robert J. Kleberg Public Library is not responsible for damage to personal equipment due to misuse of the Internet and all other uses. Users should refer to their owners' manuals or other support services offered by their device manufacturer. Like most wireless hotspots, the library's Wi-Fi Network (kplpublic) is unencrypted and unfiltered. Use of the wireless connection is done at the patron's own risk. By using this connection, patrons acknowledge that hacking and security concerns are an inherent risk associated with any wireless service. For that reason, patrons expressly agree that they knowingly assume such risk, and further agree to hold the Robert J. Kleberg Public Library harmless from any claim or loss arising out of, or related to, any such instance of hacking or other unauthorized use of access into the patron's computer. The Library strongly recommends that patrons be internet-safe and careful about what information is sent over the wireless network. Visiting sensitive websites that deal with banking, credit card information, or personal identity information is strongly discouraged. Most websites that deal with this type of information will identify a secure connection in your address bar. If you see https:// , you are on a SECURE connection. If you see http:// , you are on an INSECURE connection. The library cannot guarantee that information sent over the wireless network will not be stolen, nor is it responsible for any type of identity theft should it occur. The user assumes the responsibility of being safe and guarding their personal information while doing wireless Internet transactions. By using the library's wireless connection, patrons acknowledge that hacking and security concerns are an inherent risk associated with any wireless service. For that reason, patrons expressly agree that they knowingly assume such risk, and further agree to hold the Robert J. Kleberg Public Library harmless from any claim or loss arising out of, or related to, any such instance of hacking or other unauthorized use of access into the patron's computer. The Library accepts no responsibility regarding the ability of patron-owned equipment to connect to the wireless network, or for any software downloaded and/or installed, email opened, or sites accessed while patron is using the library's wireless Internet connection. In addition, any damage done to the patron's equipment, or self, from accessing the Internet from the library's wireless access point is the sole responsibility of the patron; and the patron agrees to hold harmless, indemnify, and unconditionally reimburse the Robert J. Kleberg Public Library of any damage, liability, costs, claims, or expenses that the Robert J. Kleberg Public Library may incur that arises in any manner from any use or misuse of the Internet by the patron. Any restriction or monitoring of a minor's access to the Wireless Network is the sole responsibility of the Parent, Legal Guardian or Caretaker.